Renovate existing pool by removing current wall @ east end and adding new stone coping and waterline tile to provide an updated look. Infill existing rear landscape area with additional plantings to work within existing shrubs. 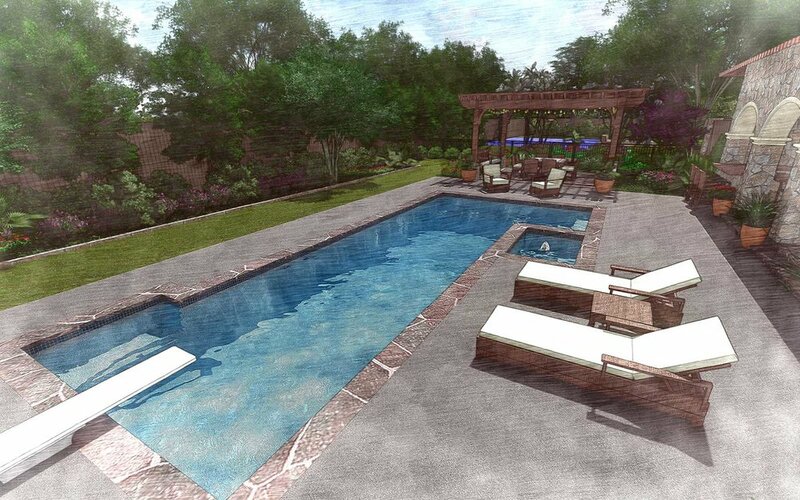 Add new pool terrace sitting area & shade structure @ east end of pool to provide additional outdoor entertaining and seating space. New seating area @ east end of pool and adjacent to new outdoor shade structure. Build new wood shade structure with ceiling fan, party lights and adjacent seating to provide outdoor dining & connection between pool & east side yard. Create formal garden area around existing circular walkway & crape myrtle trees. View looking through new shade structure towards pool area.